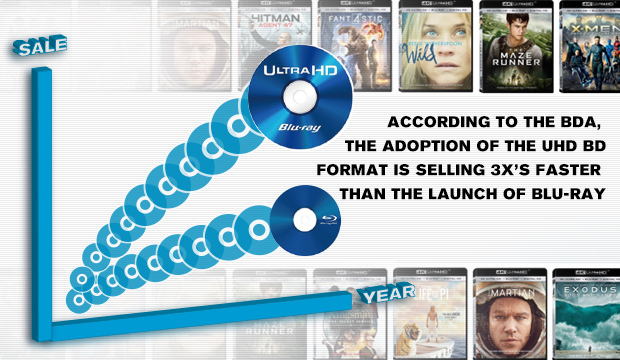 When the original 1080p Blu-ray was first announced, the adoption rate was not as quick as the industry had hoped for. There were many reasons for the initial slow adoption rate, including the customers reluctance to upgrade their existing TVâ€™s and DVD players, the perceived lack of clarity and definition over the prevailing DVD, the uncertainty of the format wars between Blu-ray and HD DVD, or any other number of reasons. The fact is that the growth of Blu-ray was much slower than expected. Fast forward to 2016 and the introduction of the new 4K Ultra Hi-Def Blu-ray (UHD BD) and the situation has changed dramatically. According to data from the Bu-ray Disc Association (BDA), US consumers bought 1.8 million UHD Blu-ray discs in 2016, along with 300,000 UHD Blu-ray players. That is a solidly impressive number for a format that hasnâ€™t fully rolled out and a number of the most popular players, including the Sony Playstation, do not support UHD content yet. In fact, the BDA declared that UHD BD has sold 3 times faster than standard Blu-ray at its launch. This again tells me, and should show you, that optical discs are not going to be obsolete and that consumers still enjoy and will continue to purchase physical media, like UHD BD discs, rather than just rely on the cloud to deliver content. So when you hear that discs are dead, tell them youâ€™ve heard that rumor before and that youâ€™re not buying it! For more details about Vinpowerâ€™s offerings, please visit our website www.vinpowerdigital.com, or contact a Vinpower representative near you.